Masa beredar secepat kilat, sampailah masa untuk mengisi laporan kemajuan tesis saya. Apabila saya mengisi bahagian yang menyatakan masalah yang saya hadapi dalam penulisan tesis, saya ketawa tiba-tiba. Kesukaran memperoleh sumber dalam bahasa Melayu, maka banyak penterjemahan diperlukan. Masalah paling ketara yang saya hadapi ialah penterjemahan karya-karya Li Qingzhao ke Bahasa Melayu. Sumber-sumber dalam bahasa Melayu adalah kurang, maka banyak penterjemahan diperlukan memandangkan sumber-sumber yang saya rujuk adalah dalam bahasa Cina dan Inggeris. Ini telah melambatkan kemajuan penyelidikan saya. Kajian terdahulu tentang Li Qingzhao jarangnya dijalankan dalam bahasa Melayu. Maka, kajian saya terpaksa merujuk kepada sumber-sumber dalam bahasa Cina dan bahasa Inggeris serta menterjemahkannya ke dalam bahasa Melayu. Ini telah melambatkan kemajuan kajian saya. Pandainya saya. Boleh menggunakan ayat yang berlainan untuk memberi alasan bagi kemajuan saya yang tidak begitu memuaskan. Daripada laporan-laporan tersebut, saya dapati nampaknya saya tidak memperoleh apa-apa kemajuan dalam tiga tahun yang lepas. Memang berasa malu untuk menuliskan laporan “KEMAJUAN”. Now, it’s the turn to talk about Burns Cottage. Before talking about Burns Cottage, I must introduce a guy to you first. Ladies and gentleman, let’s meet with Mr. Robert Burns. He is Scotland’s most remarkable and best-loved son. The Scottish say he is a humanitarian, national hero, poet and musician, lover and international son. I believe you still have no idea about him. Then, please allow me to introduce him from a foreigner’s view. He is the writer of Auld Lang Syne (友谊万岁). You should have an idea about him now, right? 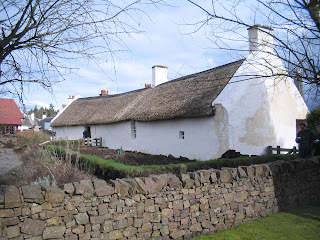 Robert Burns was born on 25 January 1759 at Burns Cottage. He stayed there until he was seven years old. The cottage was built by Robert Burns’ father William Burnes two years before Robert was born. Do you notice that Robert Burns’ surname was different from his father’s? It’s not a typo! Robert Burns dropped the “e” from his surname to adopt the more common Ayshire spelling of “Burns”. Ok, let’s go back to the Cottage. Roberts Burns and his brother, Gilbert received their early education at the cottage. Anyway, Robert Burns never went back to the cottage in his life until he died at 37 years old. Since the Scottish are proud of Robert Burns, so everything related to him is considered important too. Therefore, we had a trip to the cottage to see its real appearance. There is a museum beside the cottage which so called the world’s most important Robert Burns collection. (Honestly, I doubt about this…) There are books and manuscripts, personal artefacts as well as art and “Burnsiana” in the museum, but not as massive as I imagined when I was reading the leaflet. Even though I’m not very familiar with Robert Burns, but I enjoyed the trip as it’s good to see how the Scottish take good care of their heritage. What did you do on April Fool’s Day? From the photos I uploaded this morning, I believe you know that Thiam Kian and I had an outing on that day. We went for a trip to Culzean Castle and Burns Cottage organised by University of Glasgow's International Student Office. Both of the places are in the south west of Glasgow. It took us 1.5 hours to go there. 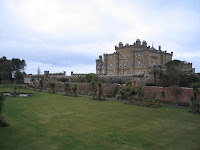 Let’s talk about Culzean Castle first. Before I forget, let me tell you that we need not to pronounce the "z" for Culzean. Culzean Castle dates back to the 12th century, but the castle we see nowadays was mainly designed and built in the 18th century. The famous Scottish architect, Robert Adam (1728 - 1792) was the designer of the castle. It belonged to the Kennedy family. The tour guide emphasised, this Kennedy family has no connection to the Kennedy family in the USA. The purpose for building this castle was because the family wanted to have a big house for all of their family members. Of course, they wanted to defend themselves from their enemies too. Therefore they decided to build the castle at the current location, where there is sea cliff at the back and gutter in the front to provide natural defences to the castle. Anyway, after staying in this castle for about 150 years, the Kennedy family gave the castle to the National Trust for Scotland in 1945. Do you know why they did so? The reason was that the family was unable to pay 74% of heritage tax to the government. What a high tax, sigh! After walking around the castle, we moved to the Camellia House. It's a greenhouse in Culzean Country Park. Have you seen the photos we took in front of the Camellia House? My friend, Toung said, the photos we took between branches of the tree are Bollywood style photos. What say you? Flowers in front of Camellia House attracted our attention. For sure, we took a lot of photos with the yellow flowers. Toung said again, it's impossible for people to be prettier than flowers. Why I always have such honest friends? It's not easy to be "orang kecil", right? Do remember to treat your students well in future. Sigh! I think my supervisor hates to read my reports too. I just write two reports a year and I feel "half dead". Don't know how my supervisor feels? She has a lot of students. nice one...as promised, come and "conteng-conteng". 18/04/2006 09:12 Welcome to my blog!